A number of major cities, most notably London, have designated areas around their built-up areas as green belts, in which development is restricted, in an attempt to curb urban sprawl. The towns within the green belt are not permitted to grow as much as they would in an unrestricted setting, where the built-up areas would merge into a large contiguous urban area. Seeking access to jobs in the urban core, many commuters instead live beyond the greenbelt and commute over long distances. There has been some this policy’s effect on housing prices, for example in Ottawa and in London by YIMBY. In the US, this policy is less common than in Britain and Canada, but exists in Oregon in the form of the urban growth boundaries (UGBs), especially around Portland. The effect has been the same, replacing a continuous sprawling of the urban area with discontinuous suburbanization into many towns; the discontinuous form is also common in Israel and the Netherlands. In this post, I would like to explain how, independently of issues regarding sprawl, such policies are friendlier to drivers than to rail users. Let us start by considering what affects the average speed of cars and what affects that of public transit. On a well-maintained freeway without traffic, a car can easily maintain 130 km/h, and good cars can do 160 or more on some stretches. In urban areas, these speeds are rarely achievable during the day; even moderate traffic makes it hard to go much beyond 110 or 120. Peak-direction commutes are invariably slower. Moreover, when the car gets off the freeway and onto at-grade arterial roads, the speed drops further, to perhaps 50 or less, depending on density and congestion. Trains are less affected by congestion. On a well-maintained, straight line, a regional train can go at 160 km/h, or even 200 km/h for some rolling stock, even if headways are short. The busiest lines are typically much slower, but for different reasons: high regional and local traffic usually comes from high population density, which encourages short stop spacing, such that there may not be much opportunity for the train to go quickly. If the route is curvy, then high density also makes it more difficult to straighten the line by acquiring land on the inside of the curves. But by and large, slowdowns on trains come from the need to make station stops, rather than from additional traffic. The greenbelt is naturally in green, the cities are the light blue circles with the large central one representing the big city, and the major transportation arteries (rail + freeway) are in black. The towns within the greenbelt are all small, because they formed along rail stops before mass motorization; the freeways were built along the preexisting transportation corridors. With mass motorization and suburbanization, more development formed right outside the greenbelt, this time consisting of towns of a variety of sizes, typically clustering near the freeways and railways for best access to the center. The freeways in this example metro area are unlikely to be very congested. Their congestion comes from commuters into the city, and those are clustered outside the greenbelt, where development is less restricted. Freeways are widened based on the need to maintain a certain level of congestion, and in this case, this means relatively unimpeded traffic from the outside of the green belt right up until the road enters the big city. Under free development, there would be more suburbs closer to the city, and the freeway would be more congested there; travel times from outside the greenbelt would be longer, but more people would live closer to the center, so it would be a wash. In contrast, the trains are still going to be slowed down by the intermediate stops. The small grandfathered suburbs have no chance of generating the rail traffic of larger suburbs or of in-city stops, but they still typically generate enough that shutting them down to speed traffic is unjustified, to say nothing of politically impossible. (House prices in the greenbelt are likely to be very high because of the tight restrictions, so the commuters there are rich people with clout.) What’s more, frequency is unlikely to be high, since demand from within the greenbelt is so weak. Under free development, there might still be more stops, but not very many – the additional traffic generated by more development in those suburbs would just lead to more ridership per stop, supporting higher frequency and thus making the service better rather than worse. In theory, this suburban paradigm lets both trains and cars cruise through the unbuilt area. Overall commutes are longer because of the considerable extra distance traveled, but this distance is traversed at high speed by any mode; 120 km/h is eminently achievable. In practice, why would there be a modern commuter line on any of these arteries? Commuter rail modernization is historically a piecemeal program, proceeding line by line, prioritizing the highest-trafficked corridors. In Paris, the first commuter line to be turned over to the Metro for operation compatible with city transit, the Ligne de Sceaux, has continuous urban development for nearly its entire length; a lightly-trafficked outer edge was abandoned shortly after the rest of the line was electrified in 1938. If the greenbelt was set up before there was significant suburbanization in the restricted area, it is unlikely that there would have been any reason to invest in a regional rail line; at most there may be a strong intercity line, but then retrofitting it to include slower regional traffic is expensive. Nor is there any case for extending a high-performing urban transit line to or beyond a greenbelt. Parts of Grand Paris Express, namely Lines 14 and 11, are extended from city center outward. In contrast, in London, where the greenbelt reduces density in the suburbs, high investment into regional rail focuses on constructing city-center tunnels in Crossrail and Crossrail 2 and connecting legacy lines to them. In cities that do not even have the amount of suburban development of the counties surrounding London, there is even less justification for constructing new transit. Now, you may ask, if there’s no demand for new urban transit lines, why is there demand for new highways? After all, if there was not much regional travel into these suburbs historically, why would there be enough car traffic to justify high investment into roads? The answer is that at low levels of traffic, it’s much cheaper to build a road than to build and operate a railway. This example city has no traffic generators in the greenbelt, except perhaps parks, so roads are cheap to build and have few to no grade crossings to begin with, making it easier to turn them into full freeways. The now-dead blog Keep Houston Houston made this point regarding a freeway in Portland, which was originally built as an arterial road in a narrow valley and had few at-grade intersections to be removed. At high levels of demand, the ability to move the same number of people on two tracks as on fourteen lanes of freeway makes transit much more efficient, but at low demand levels, rail still needs two tracks or at least one with passing sidings, and high-speed roads need four lanes and in some cases only two. The overall picture in which transit has an advantage over cars at high levels of density is why high levels of low-density sprawl are correlated with low transit usage. But I stress that even independently of sprawl, greenbelts are good for cars and bad for transit. A greenbelt with legacy railway suburbs is going to feature trains going at the normal speed of a major metro area, and cars going at the speed of a more spread out and less populated region. Even a greenbelt without development is good urban geography for cars and bad one for transit. 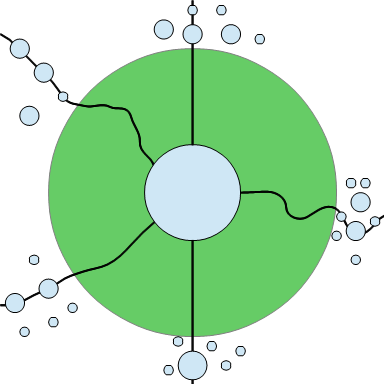 As a single exception, consider what happens when a greenbelt is reserved between two major nodes. In that specific case, an intercity line can more easily be repurposed for commuting purposes. The Providence Line is a good example: while there’s no formal greenbelt, tight zoning restrictions in New England even in the suburbs lead to very low density between Boston and Providence, which is nonetheless served by good infrastructure thanks to the strength of intercity rail travel. The MBTA does not make good use of this infrastructure, but that’s beside the point: there’s already a high-speed electrified commuter line between the two cities, with widely spaced intermediate stops allowing for high average speeds even on stopping trains and overtakes that are not too onerous; see posts of mine here and here. What’s more, intercity trains can be and are used for commutes from Providence to Boston. For an analogous example with a true greenbelt, Milton Keynes plays a role similar to Providence to London’s Boston. However, this exception is uncommon. There aren’t enough Milton Keyneses on the main intercity lines to London, or Providences on the MBTA, to make it possible for enough transit users to suburbanize. In cities with contiguous urban development, such as Paris, it’s easier. The result of a greenbelt is that people who do not live in the constrained urban core are compelled to drive and have poor public transportation options. Once they drive, they have an incentive to use the car for more trips, creating more sprawl. This way, the greenbelt, a policy that is intended to curb sprawl and protect the environment, produces the exact opposite results: more driving, more long-distance commuting, a larger urban footprint far from the core. 1- One form of greenbelt is farmable land protection laws that protect lands that can be farmed from development. Since cities, for historical reasons, tend to be located in the middle of fertile plains, this often results in a de facto greenbelt law imposed upon all cities and towns. This is what Québec has and, if I remember correctly, the Netherlands also. These regulations often give a certain allotment to all towns to grow a bit, but tend to be slow to de-zone protected land once that allotment is spent, resulting in leap-frogging development. 2- A big impact of this form of regulation is that since development, not only residential but commercial and industrial too, is pushed back outside the belt, it creates a dispersal of housing and jobs, causing a rise in suburb-to-suburb commuting (and commercial trips). This is the single biggest issue I know, because suburb-to-suburb transit options tend to be few and unreliable, often lacking demand to justify transit lines. In some instances, people going to the next clockwise suburb often basically have to go downtown to go there, making a huge detour, because the transit system is purely radial.. Protecting farmland is a valid concern, and sometimes conflicting objectives have to be balanced. But if the development is simply pushed outwards, it still occupies the same amount of farmland (plus the longer transportation corridors). This is only helpful if the farmland outside the greenbelt is less valuable. If you want to protect farmland, why not protect everything instead of only a belt around the city? Too impractical? With regard to Portland specifically (I grew up there), I don’t remember the UGB having much of a belt-like nature. The areas that we used think of as long commutes (Forest Grove, Hillsboro, Gresham, Tualatin, Wilsonville) are within the UGB. Maybe some people commute from really far, like Salem, but I don’t think there’s very many. And I think barring the UGB there would be basically no additional development of land near Portland. And in the general case, couldn’t these issues all be solved just by extending the green belt to infinity, or effectively so? You seem to take as given that the restricted zone has to terminate within reasonable commuting distance. This is a good article, and I’ve never had cause to dissent on this blog before. Also, I can’t speak for Boston, but unfortunately your hypothesis doesn’t match the situation with London’s green belt. If you’d care to take a look at the Great Northern route map (http://www.thameslinkrailway.com/download/6552/great-northern-route-map/), you can see that there are five overlapping main routes, but the timetable is actually much more complicated. First, though it’s not clear to me exactly which stations fall within it, the Metropolitan Green Belt extends no further than Sandy and Royston. 5. Suburban trains from Welwyn Garden City, and Letchworth Garden City via Hertford North (calling everywhere). b) Intercity trains go from Stevenage to King’s Cross in 25 minutes with no stops, 35% less than the same journey on a semifast service. c) Cambridge express trains take 50 min, 40% less than the same journey on a semifast service. d) Fast trains go from Letchworth to London in 30 min, 40% less than the same journey on a semifast service. It is obvious that, if every train stopped at every station, journey times out to the edges of the Metropolitan Green Belt would be intolerable. However, the signalling system in use in this area is fairly modern; the stations are fairly wide, which means spare platforms can be used as passing loops; and the line runs on quadruple track as far as Welwyn Garden City. It’s therefore possible to run large numbers of trains at several different speeds, and a speedy and effective commute is available. (Note: this is probably the second-best developed such line into London). Comparing this to the roads, well, oh dear. Google Maps tells me that if I want to drive to King’s Cross from Cambridge to arrive at 0850 on a Wednesday morning, I should take the M11 and leave Cambridge station at 0610. This despite the fact that the M11 runs, as you described, almost entirely through countryside and has only seven intermediate junctions on the 70 kilometers involved in this route. Further inspection shows that the M11 is expected to be free-flowing until after J6, which needs to be reached by 0700. From there it’s only 29 km to King’s Cross, a distance completed at an eye-watering average of 16 km/h. There will then be nowhere to park. (This route just barely avoids the zone of the Congestion Charge, which is £10 a day.) Admittedly, without the green belt, the intolerable congestion would begin much further out. However, regardless of the green belt, the London built-up area is doing a magnificent job of discouraging auto commutes. Of course, the Metropolitan Green Belt is still obsolete. It was instituted as a knee-jerk response to the entire (rural) county of Middlesex being obliterated by low-quality, low-density mass housing in a few short interbellum years, in a time before indoor plumbing was retrofitted and smokeless fuel was mandatory, when the countryside meant clean air and water, and the city meant tuberculosis and coal dust. The apparently insurmountable problems of urban life were kept from spreading further into the countryside, and agricultural land was protected in the era when food scarcity was a credible threat; but the fact that it’s now vaguely sensible to commute from Northamptonshire shows that those problems have only given way to new ones. Food prices are so low that 60% of UK farmers would be bankrupted if EU CAP subsidies were withdrawn; the UK imports a third of its food, and agriculture contributes only 2% of GDP. As the current recession deepens, pressure on London’s obscenely, inhumanely inflated housing market will ease up a little; but the most recent demographic projections still show over two million people moving to London by 2030. It’s not clear where they’re going to live, but my money’s on those delightful garden sheds. I for one am very intrigued by the recent finding that the MGB has 20,000 hectares of undeveloped land within 800 metres of an existing railway station. Though this is less than 4% of the overall area of the greenbelt, the report estimated that this would be enough land to build a million homes. We have the technology to build houses that supply zero-carbon net power to the electrical grid with no higher build costs than current standard developments, so if it were up to me, I would be building a million new homes on the MGB and using their electricity surpluses to relieve pressure on the grid, whose margin of safety for reliable generating capacity will be negative this winter. However, across the UK, there is also currently enough land with planning permission for residential development to build 400,000 new homes, and these plots are being kept dormant for speculation by the so-called developers in a pretty clear case of market failure. It would probably be easier to do something with those first. Regarding the undeveloped land near stations, if I’m doing this right, 20,000 hectares is 200 km^2. Taking circles of radius 800 m, that would imply 100 stations with no development within the radius, or 200 stations with half the area developed. Is that really the case or did I mess up the math? Well it’s all to do with the history of the railways, The larger and busiest stations are all now in the centres of their repsective towns. But when the railways were built the railways only went bothered with the cost of building a line through an urban area if the market was large enough. There a large number of stations in rural areas where the local station might be on the edge of town. Or it is often in the middle of nowhere next to a road connecting several small towns and villages. Even today if you train ticket take to station with ROAD/STREET or JUNCTION in the title, there is a good chance you will be a long taxi ride from your destination and I hope someone is picking you up. Of course over the years such stations have either been closed due to low patronage or gained later developement around them if they were in commuting distance of a major city. Planning is very strict in the UK and most local plans will direct new housing to just a few of the largest towns and is extremely restricted in all small settlements. Rail commuting has expanded massively over the last century and has pushed further and further out as rail speeds have continued to rise to cash on lucrative long distance commuters. Many of these small stations these days act as rail heads for the commute into London and are often surrounded by large car park, where people drive to from surrounding villages and towns before commuting to London. Some of these stations are quite large and bust these despite there still being no surrounding development. Many of the these stations will often have just half hourly service, but this is good enough for commuting. Yes, it’s still more advantageous to take trains in the London commuter belt, but this is despite the greenbelt and not because of it. Traffic speeds in the greenbelt are pretty fast; then you get to London and have to deal with internal London traffic. This argument is mostly focused on commuters from the periphery, and so I have to ask: how does the greenbelt affect travel in the urban area contained within? If it acts as a girdle, promoting more dense and transit-friendly growth within, then might that not offset the increased auto commute somewhat? “If the greenbelt was set up before there was significant suburbanization in the restricted area, it is unlikely that there would have been any reason to invest in a regional rail line” I’m not sure about this; regions with political support for transit seem perfectly capable of supporting direct-to-exurb lines when applicable. The recently-modernised Gyeongchun and Jungang lines in Seoul seem to pass through significant areas with essentially no development, and Toronto is planning to modernise the commuter lines that cross its greenbelt. Other possible examples include Melbourne-Geelong, Madrid-El Escorial, SF-Dublin/Concord and Caracas-Los Teques. For that matter in your Ottawa example, the greenbelt is crossed by a busway to Fallowfield and is likely to be crossed by light rail in the future. The Toronto electrification is in a context of a system where most ridership comes from the Lakeshore lines, which don’t cross the greenbelt. The cross-greenway electrification involves the Stouffville Line and the Barrie Line. In the case of Stouffville, the core of the line, with 15-minute all-day frequency planned, only extends to Mount Joy, before the greenbelt starts. The rest of the line is also to be electrified, but looks more like my first example city than my second example, and is only planned to host hourly frequency. In the case of Barrie it’s more complicated, because the frequent core extends to Aurora, within the greenbelt; however, Aurora’s built-up area is almost contiguous with that of Toronto, separated only by 600 meters’ worth of Bathurst Glen Golf Course, making it again be very much like my first example. Completed electrification to Lincolnville and Barrie is a might-as-well project: if so much of the rest of the line is electrified, might as well finish it. Obviously not everyone thinks in this might-as-well language – hence, lack of electrification on the outer Metro-North and LIRR branches, and on the London-Aylesbury line beyond Amersham – but it’s the correct approach. SF-Concord and -Dublin is a different issue – the Bay Area has mountains in the way, and not a greenbelt. This means the undeveloped area is very narrow, only a few km of mountains, with a lot of urban sprawl on both sides. It looks on the order of 5-10 km wide, vs. 10-30 in Toronto (link). The result is that new lines like BART to Concord can be built relatively affordably. The Dublin extension, across a wider unbuilt area and going to a weaker exurb, is pretty bad; part of that is the park-and-ride nature of Dublin/Pleasanton, but part is that it was a wrong priority for extension, and BART should have (and still should) focus on core improvements. BART’s core improvement gets pricey, it involves burrowing another set of tunnels across the Bay and a deep cavern station on the west side. In ideal world, the outer suburban trains would express through the inner suburbs. Frees up space on the existing BART lines for people in the inner suburbs. standard gauge so it can share tracks with the regional trains to Sacramento and Stockton. Metro North? Croton to Rhinecliff would be nice. They’d have to buy more M8s. Or get Bombardier to slap some third rail shoes on an ALP46-ish. ALP-45-ish would work for service to Penn Station. It would need some wire on the West Side. Albany to Hudson would be nice too. It’s supposedly ready for 125mph service. Lengthening platforms and upgrading substations on the Harlem Line might get more bang for the buck. At least to Suffern when the ALP45s start to wear out. Sigh, they should have been running to Macy’s basement sometime next year. Sigh. Somebody somewhere has numbers. West Hempstead branch versus Oyster Bay. Gladstone versus Spring Valley. If I had to pick one line in metro New York to electrify, the Raritan Valley line. The trick is to convince politicians to spend money now to save money when they will be dead. The somewhat recent grade crossing event (at Valhalla?) pointed out one of the problems with being too anxious to electrify – how grade crossings and 3rd rail can be a dangerous combo. The train struck the car intruding onto the tracks and propelled it into the leading edge of the (resuming) 3rd rail after the intersection, freakishly causing the 3rd rail itself to be driven into the beginning of the train, exacerbating the ill effects. The New York Central had essentially 100% grade separated its 3rd rail territory during its regime, but when Metro North came along and extended the 3rd rail on the Harlem line, they went with rolling the dice on quite a few grade crossings, including a good number where the road layout is dubious enough such that even people who are not absolute jerks can find themselves in jeopardy with a little bad luck. Politicians find that fixing grade crossings is usually undesirable mainly because of cost (and very little gratitude and adoration), but also because of technical problems or aesthetics shoehorning a bridge or tunnel into a confined and/or beloved local setting. The alternative of closing the offending road is of course strongly opposed by some vocal minority and supported only by railroad nerds and/or people who live somewhere else. The remaining (to be electrified) Harlem division of course has plenty more grade crossings to deal with (or not) if it were to be done; it would also be nice to rebuild the Harlem division further north, perhaps back up to Chatham and its connection with the B&A (CSX) and/or to Canaan in CT, with or without further electrification. Due to the large installed base of 3rd rail the (and some techincal problems in the Grand Central vicinity), the ship has pretty buch sailed on catenary, which could alleviate some of the electrical problems at grade crossings (except for landscapers driving through with cherry pickers extended and the like). The Hudson line is far less problematic with respect to grade crossings as there is very little land between the tracks and the river, so only a few low usage crossings. The cat vs 3rd rail thing is conceivably in play here too as Amtrak has frequent runs on MN’s track and owns the northern half of the ROW to Albany. IMhO, running some Metro North trains up to Albany would be beneficial in a number of ways, particularly in providing a lower price point and better station coverage in the MN area. I would be nice to see MN display some ambition too. In the DC area, there is a town called Greenbelt, I believe, which may have been build with the sort of philosophy discussed in this post in mind – I think there is also an Dept of Agriculture Research Center there combining the other Greenbelt concept. I don’t think that the concept took hold particularly, although it was a long time before development got that far out. What did happen out there was a beltWAY, DC’s perimeter interstate highway roundabout, which, once things really got going, became essentially the inner boundary of Washington’s outer suburbs. While the District itself makes it almost to the beltway at it’s 3 vertices (the 4th was given back to Virginia at some point) much of the (beltway) enclosed territory is outside DC proper. Nevertheless, one could make a (poorly defensible, but still moderately convincing) generalization that the beltway now defines the urban heartland. Transit-wise, the beltway is pretty much the limit of the Metro (except for the Silver line outlier and a few stops on the Red); within the beltway, one can imagine getting around without a car, outside, only to a limited degree. There is very little high density housing much if at all outside the beltway and the lifestyles and demographics mostly seem to transition within a few miles of the beltway at most (except by coincidence where older settlements existed already). This is all horribly unscientific and riddled with exceptions, yet considering how arbitrary was the location of the beltway in the first place, the fact that it has become any sort of meaningful boundary at all, let alone the national soundbite stereotype ‘inside/outside the beltway’ speaks mouthfuls. It definitely says something, possibly profound, about how people see themselves and their topography, but beyond the probability of some sort of we/they border and a possible need to create those boundaries, I don’t really see what’s going on myself. I don’t want to spend 4 hours getting to Manhattan and don’t want to do it sitting in a M8 seat. You don’t have to spend hours in a commuter coach if you don’t want to – take Amtrak and pay Amtrak’s fare be more comfortable. I’d like to see another pricing tier that has a chance of wooing some erstwhile drivers. Amtrak’s pricing is at best competitive with flying (to places that don’t merit good airline deals) or a single person automobile trip via a premium route (in this case that would be taking the Tappan Zee Bridge and the Thruway from NYC to Albany instead of the Taconic Parkway). A second person on your trip and/or a modest attempt to save on tolls and you’re paying significantly more on Amtrak (plus you may well wish for transportation at the other end too). I can dig it that there is some reluctance to undercut Amtrak’s pricing, but I think that there is room for a lower class of service and perhaps using commuter class equipment is a good enough distinction to keep the posh crowd on Amtrak (at least 1 of them apparently). I don’t really know what the diesel equipment is like on MN’s Hudson line, but the electric coaches (M7’s I think) are pretty decent; I think I could handle the trip if they only cost half as much. And NYS should be able to subsidize fares like that if they made even the least bit of effort to shift some of the excess funding that road projects get over rail. Of course, they don’t have enough equipment and beyond Albany (soon to be beyond Schenectady) there is CSX dispatching and conflicts, but for now (or as soon as they could get a few more trainsets), GCT-Albany would be good enough – maybe they might find a decent demand for NYC-Saratoga. Primarily, the idea is to provide a decent, not so expensive fare structure that might be closer to affordable for those who would otherwise find the car/train economics way too lopsided to be able to justify taking the train. Which billionaire is going to get the urge to have a 1:1 scale hobby railroad to subsidize the low low fare? Without subsidies the fare isn’t going to be low. You obviously haven’t taken the Taconic in a long time; those issues are so 20th century – there are still a few hazardous entry/exit ramps and a mile or two of narrow-ish roadway, but otherwise a very nice drove, much more relaxing than the thruway and a lot more scenic to boot. The distance is about the same and the only drawbacks are that the speed limit may be a little less and you need to exit the road for services; just a few small tolls at the Albany end, depending on what you do there. As for paying for subsidized fares, I said in the post that they could be covered by dipping into the imbalance between highway and rail funding. I realize that is easier said than done, but it is very easily said and that is all that Cuomo needs to do – say that this subsidy will save us a lot of money on road construction/expansion costs; he doesn’t have to actually do the saving, only say it. These trains can also serve as commuter trains in the Albany area (from both sides if they go to Schenectady), )and could help upstate legislators buy into it. I don’t know if Albany has a greenbelt or not, but if it does, this would surely penetrate it and provide some commuter action in conjunction with the city to city service. In the long run I’d like to see reasonably low cost rail in the rest of upstate too, but since we gave away the ROW to the freight RRs, we now have to bribe them and improve those ROWs to enable more passenger rail up there. Amtrak and Uncle S may be willing to ante up some help in that from time to time and given a blue moon or two. It’s lot easier to just direct the subsidy to Amtrak. There’s only a million people in metro Albany. It peters out into farms fairly close. It’s relevant that greenbelts vary greatly in size. For the two examples you mention, London’s greenbelt is usually around 25km wide while Ottawa’s is around 5km wide; these different scales have quite different effects on transportation/infrastructure. Yeah, exactly. I brought up Toronto vs. the Bay Area because they’re comparable in size, whereas London is bigger, so it does manage to run some strong services past a wider greenbelt. That said, even with the strong lines mentioned by Benjamin Goodger, London’s transit mode share outside the greenbelt is really not great. In Ile-de-France, the transit mode share is 41% or 44%, depending on source; this breaks down as 54% in Paris + petite couronne, 30% in the grande couronne. In London proper, it’s either 56% (for people living and working in London, PDF-p. 43) or 50% or maybe 48%; but then, per the last link, the mode share in the Home Counties is weak – a handful of localities, like Reading and Southend, are at or a bit above 20%, but for the most part the mode shares are in the low to mid teens. A problem of trying to draw lessons about the usefulness of Greenbelts in comparing London with Paris is the very different legacies involved. Paris-Ile de France is very lucky* in having an excellent set of large real green spaces. By “real” I mean actual mature forest and natural habitat, mostly devoid of cars and built structures. In fact there may be almost as much area in those forests and natural parks in Ile de France as in London’s Greenbelt (which of course is mostly open farmland and sparsely-developed residential). I mean the inner ones of Foret de St Germain, Montmorency, l’ile-Adam, Bois de Meudon, Foret de Senart, etc. and then the really big ones of Foret de Rambouillet (200km2), Fontainebleau (280km2), Compiègne (144km2) and Chantilly (63km2). (It is why the final stage of the Tour de France is good to watch because they usually pass thru one or more of these areas then thru the Grand & Petite Couronnes; this year it begins in Chantilly which is 40km north of the Notre Dame geo-marker.) It meant that Paris didn’t have to worry about open space, air and relentless march of sprawl swallowing the environment whole the way London did. I agree that it results in much more efficient rail transport for Paris-Ile de France. And with the further development of the Metropole Grand Paris plan of new RER and Metro lines, that will continue to improve. In turn these RER stations will promote densification-TOD, not just sprawl. London is now stuck because, while it would make sense to allow limited TOD around rail stations, it would have to be high-density, ideally in walkable communities. Not Milton Keynes-style sprawl which is exactly what the Greenbelt was designed to avoid (and couldn’t easily be served by public transport; MK is a car-based town with exactly one tenth the population of central Paris in an area of the same size, 88sqkm). But as you have pointed out, the affluent who live there won’t allow it and most who would live that “far” from London would probably expect something more like MK. Though that is changing as living anywhere in London becomes more and more unaffordable. In terms of building new cities or planning for their growth, I would say the much more important issue is rail-based public transport planning, with the “pearls on a string” model serving both functions. (ie. neither of your diagrams shown above). That is, allowing for walkable communities centred around transport hubs suitable spaced along RER-type (CrossRail-type) high-capacity, higher-speed, higher-frequency rail. Both radial and circumferential. (Hmm, a bit like MGParis!) With undeveloped, or lightly-developed space (“green” space) between. Within limits this is more sustainable than Portland’s UGB which seems to get enlarged every few years by the very growth it is designed to contain. Re those motorways into London, or even joining the M25 to skirt central London, the only time they are not busy is ridiculously early in the morning. No one drives if they don’t have to because it is a nightmare. When I lived in Oxford I have missed flights from Heathrow because of this (and came to hate early morning flights because it meant essentially no sleep the night before, and even then you were stressed). Also from Oxford I once got a ride with someone who worked at the Glaxo-Wellcome research palace north of London (just off the M25) where I was to give a seminar, and we left really early (within a 15 minute window that if you missed, condemned you to congestion by the time you reached the M25) then had to leave about 3pm for the return; driving at loony speeds for the whole 80-90km, I have no idea how she did it every day). As Benjamin Goodger wrote above, the big London commuter towns of Cambridge, Oxford, Brighton-Hove etc are all about 60 minutes or less by express train and represent a far saner lifestyle choice–only if you work in central London (and get the “London loading” that helps buy the season travel ticket). *Not entirely luck in that these were formerly royal estates and hunting preserves that became part of the state after the revolution. I presume the equivalent around London were sold off by their private owners as the city expanded? Though hardly any natural forest remained in England by the 17th century. Paris has a lot of suburban parks, yes. But they don’t really form a contiguous buffer zone of low density surrounding the city. Farther out, the pearlstring model predominates; the difference with my diagrams is that, as you note, the towns are walkable, and I’ll add contiguous with each other and much denser, so instead of a few small circles they’d be represented as a strip. Re Heathrow – was it not possible to take a train from Oxford to Paddington and switch to the trains to Heathrow? But without a greenbelt, you end up with low density, car-centric development everywhere (see virtually all of US for example) instead of more compact towns like in England and Canada. At least in England and Canada, the development is forced to be more compact and walkable, even if commutes to the city center are longer. The suburban development in both Britain and Canada is low-density and auto-oriented; the high public transit usage in the Toronto area comes from the city proper, and not from Mississauga or Brampton, let alone Barrie. If you compare Britain and Canada to the US then they do look better, but if you compare them to greenbelt-free France and Japan, they don’t. The compactness and density of inner-urban development depends more on how lax the zoning is in the inner city than on how much suburban sprawl is permitted. Canadian cities tend to be pretty YIMBY, but so do Japanese cities, without the same restrictions on suburban development. Nowadays even Paris is becoming less NIMBYish, and building a fair amount of housing, especially social housing. One possible caveat is that restricting inner-suburban sprawl with a greenbelt makes urban single-family housing more expensive, because the marginal housing unit in the greenbelt would be single-family rather than an apartment building. This in turn incentivizes replacing such housing with apartment buildings. However, Canada is uniquely bad about this: Toronto and Vancouver both upzone aggressively to allow higher urban densities, but only in areas that are commercial, deindustrializing, or multifamily residential, and not in single-family residential neighborhoods no matter how expensive they are.